Guest blog by Tom Ryan. Fr. Thomas Ryan, CSP, directs the Paulist North American Office for Ecumenical and Interfaith Relations located in the Hecker Center in Washington, DC. He leads ecumenical retreats and workshops in the U.S., Canada, and Europe. An active contemplative and lover of the outdoors, Tom has authored 14 books on a variety of themes in the spiritual life as well as the DVD Yoga Prayer. www.tomryancsp.org. He is also a member of Shalem’s 40th Anniversary Honorary Council for the 40-Hour Contemplative Prayer Vigil. 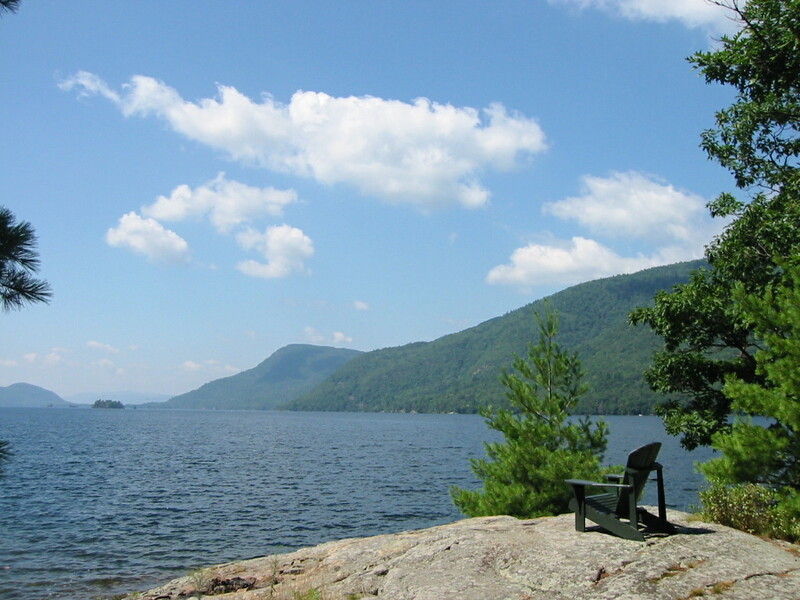 At the end of every summer, I make an eight-day retreat to my sweet spot on the planet, an island in the middle of Lake George in upstate NY owned by my community, the Paulists, since the early 1860s. There’s a cabin among the trees , and the island is embraced on both sides of the lake by the forested mountains of Adirondack State Park. When the Jesuit missionary explorer Isaac Jogues first descended the lake in a canoe with native Americans, he was so taken by the transcendent beauty of the 32-mile long lake and mountains that he named it Le Lac du Saint Sacrament (French for: Lake of the Blessed Sacrament). Here is a poem I wrote on my retreat on the island at the end of August. in a dark forest-green cape. over le Lac du Saint Sacrament.